The big day is nearing for Venus Express, the European spacecraft dedicated to studying the atmosphere of Venus. After completing the final phase of functional testing, the spacecraft has now arrived at the Baikonur Cosmodrome in Kazakhstan, where it will be launched atop a Soyuz-Fregat vehicle in October. CNES is a partner on this mission. The Venus Express spacecraft recently completed development and integration at Intespace in Toulouse, France. It has been undergoing a full series of functional tests since October 2004. The spacecraft has been subjected to system-level tests, including vibration, acoustic and thermal vacuum testing to verify that it will survive launch and withstand the cold of deep space, as well as the harsh thermal conditions created by the vicinity of the Sun at Venus. After completing tests, the spacecraft has been shipped to its launch site in Baikonur, Kazakhstan, where it is scheduled to depart in October atop a Soyuz launcher with a Fregat upper stage. The journey to Venus will take 153 days, plus a further 5 days to move into orbit about the planet. Venus Express is the 1st European spacecraft dedicated to observing Venus from orbit. The probe will fly around Venus in a quasi-polar orbit at an altitude of 250 to 66,000 km. For 2 Venus days (equivalent to 500 Earth days), Venus Express will analyse the planet’s atmosphere, ionosphere and volcanic activity. CNES is involved in this European mission and is contributing to 3 science experiments. 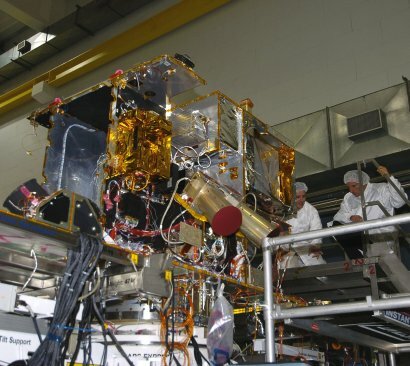 The Virtis1 and Spicav2 spectrometers will analyse the planet’s atmosphere, while the Aspera-43 instrument will study its ionized environment. 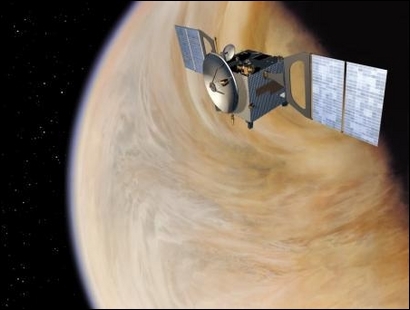 The Venus Express mission has taken only 4 years from concept to launch. The project got underway in 2001 and the satellite is derived directly from Mars Express and re-uses some of its subsystems. Esa selected EADS Astrium to build the spacecraft in October 2002.